Cruelty Free Fragrances - Just as hard to find? Sweep wasn't too pleased with these. I've talked about cruelty free make-up a few times but sometimes we forget, fragrance too might not be ideal to those who are cruelty / vegan friendly. Just as I am with my make-up collection, trying to sort out what's good and bad by my belief stand point, my fragrances need to be sorted out too. 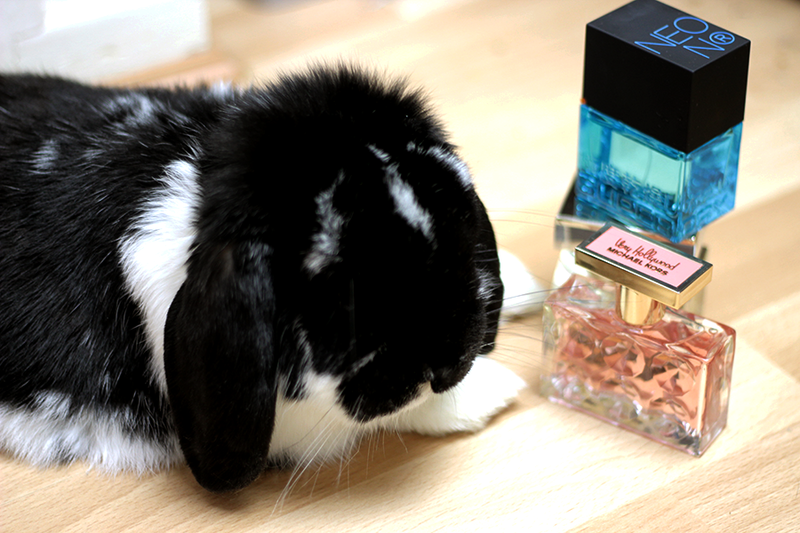 Finding out fragrances that are cruelty free doesn't seem as easy as with some cosmetic brands, a lot don't declare and some our distributed under various Cosmetic houses. Why I decided to mention this was because I'm still browsing through the sales and I decided to visit House of Fraser to see what fragrance sales they had happening as I wanted to purchase a few ready for the Spring - Summer ( eager beaver ) after taking this quiz and realising I could be purchasing fragrances that aren't cruelty free made me think, more attention has to be made. Favourites such as Tom Ford, Marc Jacobs, Hugo Boss, Jennifer Lopez. I did read that Versace does not test and Rihanna's perfume - cruelty free. I'd love if there was a straight fragrance list but with the company changing constantly like Urban Decay being sold to L'oreal? Um hello. Your rabbit is gorgeous so cute! I have heard about this news but this is the first time I got to know in details. Anyway it’s a very effective article. Thanks for informing us. This is really good point you are taking out to. Now a days lot of people concern about cruelty free products. I all ways am looking forward to have cruelty free products. Picture of a rabbit is printed on the products container if the products are cruelty free.